This article was originally published on Tattooed Football. In the dusty streets of Jayyus in the West Bank, the language that children use cuts through adult constructed divisions. The names of Abbas or Netanyahu are alien. What rolls off the lips of the children here are the names of Messi, Fabregas and Puyol. Jayyus is a small farming community situated near the town of Qalqiliya in the West Bank. It has been devastated by the construction of the separation barrier (which is universally acknowledged to be illegal under international law). 75% of the village’s farmland is now on the wrong side of the barrier. Recently, the village has seen a number of Israeli Defence Force incursions that have resulted in a number of local boys arrested. These events however are just distractions for the children from the more serious business of street football. The challenge is simple – who can get as close to mastering Messi’s majesty as possible. To this goal, the children spend hours trying to match his touch, skill and athleticism. There is one coffee shop in the village where every Barcelona game is watched religiously and you can see every detail being gulped down with enthusiasm. The attendance, dedication and passion given to this cause is unwavering. In a situation so bleak, it is heartening to see children throw their enthusiasm into football. I am sure it is a more productive use of time than throwing stones at the IDF. Equally, in a time when football seems so personified by casual racists, materialists and playboys, I find it heartening to see Messi being held up as a role model. Messi manages, both on and off the pitch to balance his enthusiasm with a calm composure. Messi also represents the dream that every child holds onto. He was taken from his home in Argentina at the age of 13. It is said he was only 4 foot 7 inches when he signed for Barcelona. From this he has developed into undoubtedly the greatest footballer of a generation. 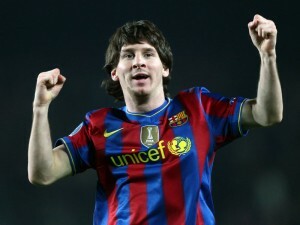 Messi has gone from being a small shy boy playing street football to be earning and inspiring millions. It is this romance that drives children all over the world. Messi provides each child with a chance to dream. Cut off from life chances, it is this hope that keeps children going. This hope is communicated through the language of Barcelona. Football connects the children on the streets of Jayyus to billions around the world. Whatever the language their government or the occupying government speaks – these children will always be fluent in the language of football. No one can take that away from them. Steve Hynd is currently an EA with EAPPI and is living in Jayyus, West Bank. Fantastic Steve. I have found the same in the slums, refugee camps and village playgrounds of Africa. We must give these children not only something to dream about – but also the possibility of realising their dreams. Their is so much potential, so much hope – we need to tear down so many of the adult created divisions and hatreds. Lets create the level playing field – the children will do the rest.